The Optrel® Panoramaxx auto-darkening welding hood provides up to 6X the viewing area of a standard 2" X 4" auto-dark welding lens. The key to this revolutionary technology is the size and shape of the ADF, coupled with the unique Panoramaxx shell design, which allows the welding lens to be positioned closer to your face. The Panoramaxx also has advanced features like Autopilot, which automatically adjusts the shade level based on the brightness of the arc and True Color, which allows for realistic color perception in light or dark states. The Panoramaxx has bright, clear shade 2.5 light state and a built-in rechargeable battery that does not need replacing. The battery is charged through arc light or when manual charging is necessary, a micro USB charging port. 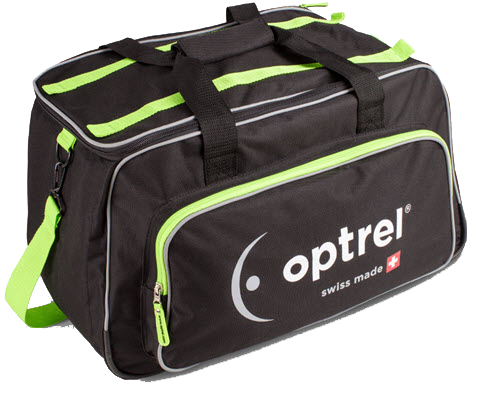 It comes complete with micro USB cable, helmet bag and Oprel's 2+1 warranty. PANORAMA FIELD OF VISION - The Panoramaxx offers a 6 times larger field of vision than standard welding helmets � and is still a lightweight at only 19.4 ounces. AUTOPILOT - Detection of the arc brightness and fully automated shade level adjustment from 5 to 12. 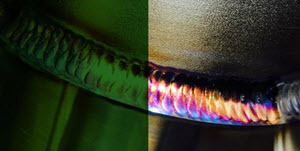 Adjusts automatically to the changing light conditions of the current welding method. LIGHT STATE 2.5 - The much brighter view of your working environment in light state increases both safety and efficiency in the workplace. STATE-OF-THE-ART POWER TECHNOLOGY - With its rechargeable power-pack, changing batteries is no longer necessary. MULTI SENSOR DETECTION - The completely redesigned controls of the 5-sensor array ensure the perfect regulation of the auto-darkening filter. Pkg. of 1 - Genuine Optrel® Panoramaxx +1.50 magnifying lens for your Optrel® Panoramaxx welding helmet ONLY. Pkg. of 1 - Genuine Optrel® Panoramaxx +2.00 magnifying lens for your Optrel® Panoramaxx welding helmet ONLY. Pkg. of 1 - Genuine Optrel® Panoramaxx +2.50 magnifying lens for your Optrel® Panoramaxx welding helmet ONLY. Pkg. of 5 - Genuine Optrel® clear front cover lens for your Optrel® Panoramaxx welding helmet. Pkg. of 5 - Genuine Optrel® clear inside cover lens 5000.010 for your Optrel® Panoramaxx welding helmet. Pkg. of 2 - Genuine Optrel® nose guard pad 5003.600 for your Optrel® Panoramaxx welding helmet. Pkg. of 2 - Genuine Optrel® micro USB cover 5003.520 for your Optrel® Panoramaxx welding helmet. Genuine Optrel® Panoramaxx welding helmet headgear 5003.263 is suitable for use with all Optrel® welding & grinding helmets. Genuine Optrel® Micro USB charger cable for your Panoramaxx welding hood. Optrel advises that the ADF lens in the Optrel Panoramaxx Welding Helmet 1010.000 is not replaceable. Are the lithium batteries replaceable once they have reached their useful life? Optrel Panoramaxx Welding Helmet 1010.000 does not have a replaceable battery. Does this come with a usb port cover? Optrel Panoramaxx Welding Helmet 1010.000 comes with 1 Optrel Panoramaxx Micro USB Cover 5003.520 installedon helmet. I saw the specifications of switching from bright to dark but i do not understand... i have a welding helmet that switch 1/25000 ...in the same way what is the speed of switching from bright to dark? 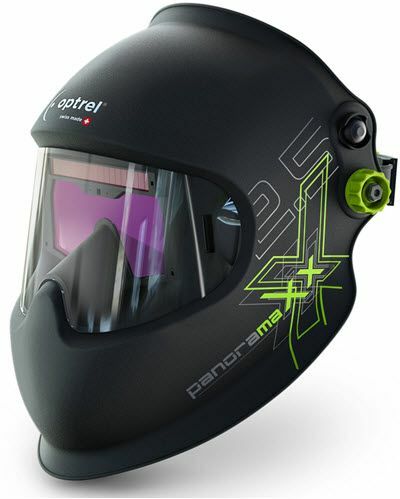 Optrel Panoramaxx Welding Helmet 1010.000 switching speed is 1/10,000 of a second. Does this helmet have the x mode? And is possible to wear a miller respirator with this helmet? 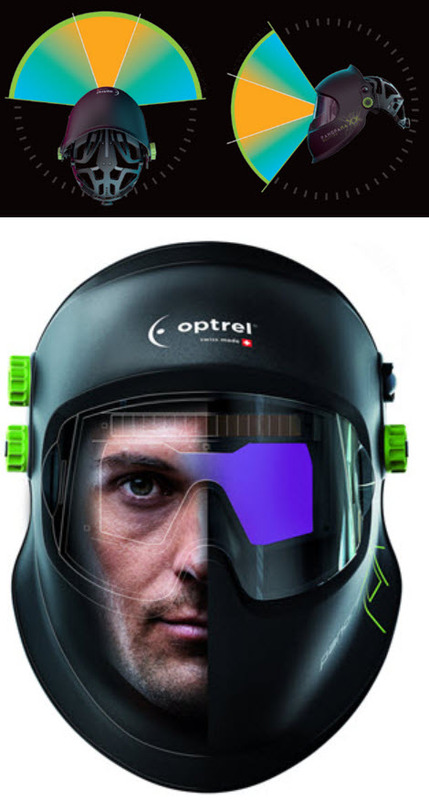 Optrel Panoramaxx Welding Helmet 1010.000 does not have x-mode. Miller LPR-100 Half Mask Respirator would be the best respirator to use with this helmet. Does this helmet compatible & comfortable for those who wear glasses ? 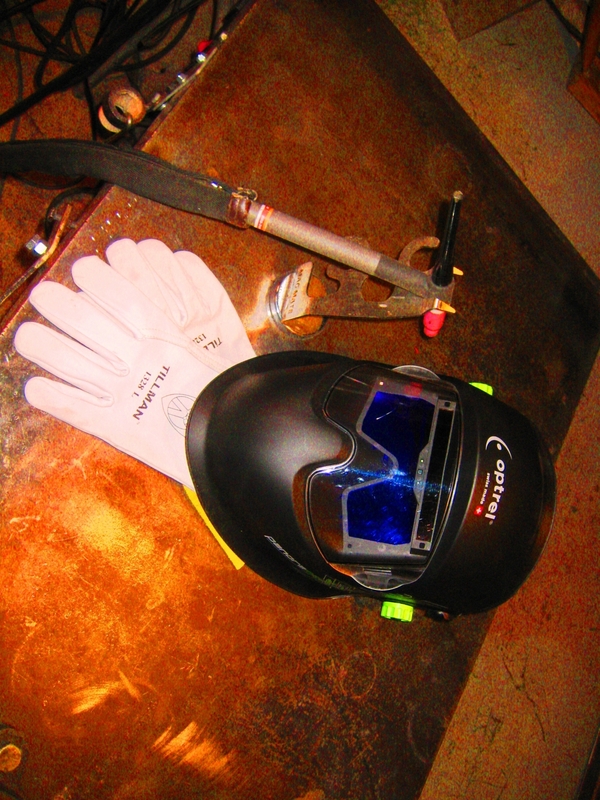 Optrel Panoramaxx Welding Helmet 1010.000 is compatible with most glasses. Is it compatible with eye glasses? Optrel Panoramaxx Welding Helmet 1010.000 will have enough room under the hood for most glasses. Will it work with glasses? Does the lens get fogged over? 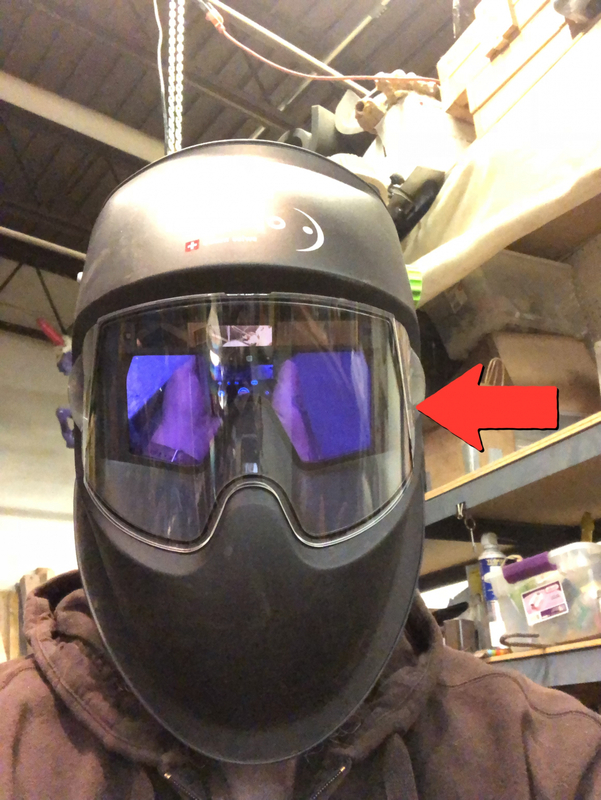 I currently use a Weldcoat Metals hood, and my breath seems to fog the lens badly. I didn't know they made things like this. Three month review. They are not playing when they say weld better instantly. My old hoods were holding me back and I am unleashed now I can see everything. 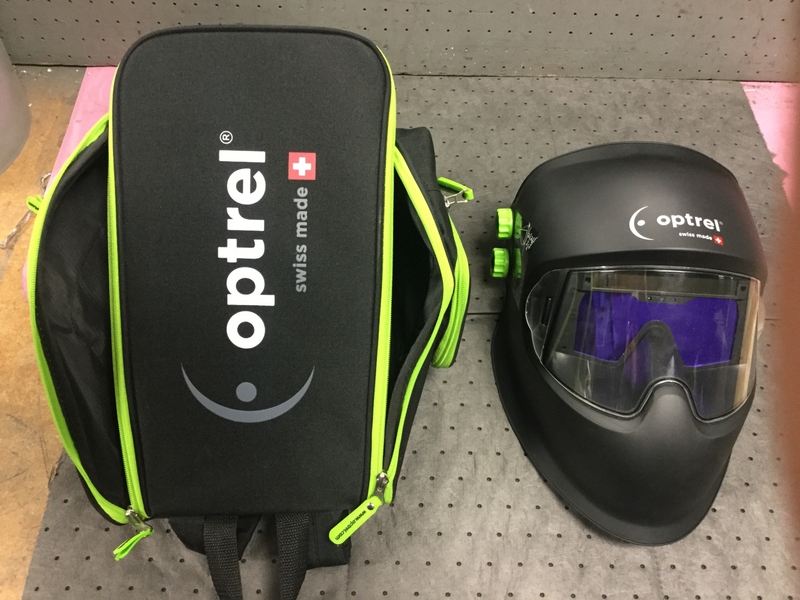 One thing nobody including Optrel talks about is the anti fog breathing system. It is very nice and you never have to worry about that. Only con is the headgear wants to fall and you always have to adjust but with this hood you never have to lift so the ton of pros outweigh the single con. Don't listen to the guy that doesn't know what true color is either. It is amazing. I weld pipe for a living and I've used a variety of hoods from Miller elites, speeglas, Phillips safety solid lens and arc one 2x4 autos. I used this hood in the field for 3 months, put it through the ringer and heres what you need to know. PROS- lightweight, comfortable, does NOT fog up, very clear with a blueish/green tint. Grind mode is awesome with the light shade and external button. Blue flasher that reminds you it's in grind mode before you strike an arc is a great feature. Internal charging as well as solar recharging. Sits comfortable without hanging over your head. Auto shade works well, especially in a fab shop situation. AWESOME CUSTOMER SUPPORT. Great sensitivity. CONS - useless with the sun or outdoors, either stays black or flickers. Outside lens is easily ruined when making tight welds or around obstacles. Lens cracked from the cold weather, optrel replaced it with no hassle (great customer support) headgear allows hood to constantly drop and not stay in upright position. Cheater lens are custom to the hood so you have spares from optrel. Not any clearer than truesight 2!!! Wish I had just kept it!!!!! I just ordered me another one. I guess I will just try to sell the Optrel!!! Nothing wrong with the hood just wasn't for me. Best hood I've used in 40 years of pipe welding. The clarity is unmatched, the auto lens shade feature is the best for TIG welding, and the other features are well designed and very functional. The only problem is the headgear does not have a secure catch to keep it in an up position. It's easy to fix with a glued in piece of plastic. I love this helmet. Sits comfortably with glasses. I find that I rarely flip the lid up anymore. The non welding state is bright and clear. Tig with sculptural bronze, I can see the pool state so much better then my last helmet. Light and comfortable for hours. ProsLight, auto dark works very well in any position, comfortable, wide field of vision. If you are in the market for a higher end hood and you've found yourself considering this one just buy it. You will not be disappointed! ProsClarity, durability, comfort, ease of controls, quality. This is a really nice helmet, smooth operation of head gear & comfortable. I did ding my nose under my glasses initially; it's really close but that's how you get that panoramic view. My face is thin and the overall affect is it of the shield right there but so far no fogging or anything. Will update this review if something develops. Fantastic Helmet - Wish I had purchased it sooner! This helmet is really nice. Huge upgrade from my $79 entry level helmet. The light state is so clear it's unbelievable and. the view of the arc and puddle are stunning. My welds have improved a lot since I started using this helmet. It works good with glasses and the Miller half mask respirator. Expensive, but well worth it. Cyberweld was wonderful to deal with; great price and fast shipping. 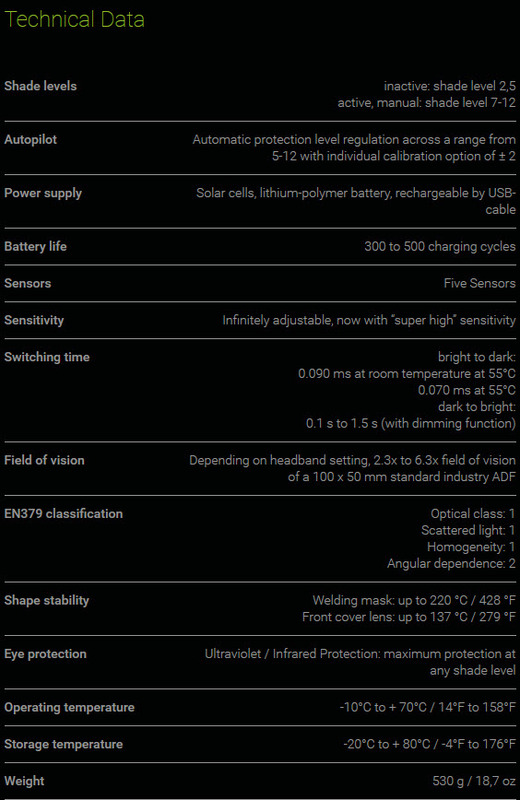 ProsLightweight, comfortable, field of view, automatic shade level, and most of all - clarity of view. Good helmet but not true color. They description of this hood is misleading. It is not true color, it is tinted green. Wish I would have known that. Very cool helmet. After spending some time getting familiar with the adjustments and getting it set to my preferences I used it mig welding. The view is awesome and works great! The way the lens fits close to your eyes gives the helmet a light weight feeling. Well balanced weight distribution. Also with your nose being in it's own area sweat isn't dripping onto the lens. It's a great investment if you do much welding. This helmet is incredible and nothing like I have ever used. I have always been a Jackson fan, but the Swiss have really knocked it out of the park. This helmet is super light, has a wide angle of view and adjusts to your welding amps automatically. Works fine with glasses on too. In the 20 years I've been welding I've used the worst harbor freight garbage hoods to the highest end Miller and 3M hoods. This Panaramax hood is, by far, the best I've ever used. I describe it like going from DVD to Blu-Ray or 1080 to 4K. It's that good. I debated far too long about this purchase! Thanks cyberweld for the timely shipping. This hood is as advertised. The clarity is just that clear and clean. I actually thought something was wrong with how clear the initial welding was. I was just not use to this. The controls work very well and are precise. I debated for 2 months about this purchase, watched all the videos. I do not impulse buy......this helmet is just what I was looking for! Don't labor on this purchase get it and don't look back. ProsClean and clear... cannot say that enough. Feels like a durable hood. Lightweight. I like the headgear! ConsNone to date. Wish welding companies would include a fiber towel to clean glass etc. all of them could do this. Great helmet. Switching speed is top notch, field of view is leaps and bounds over conventional sized lenses, weight balance while welding makes it seem like it isn't even there. The color while welding is a yellowish blue, hard to describe really but I like it. I really can't think of anything bad to say about it other than the sensitivity even when turned on minimum setting still picks up the guy in the next booth welding through a yellow plastic barrier. I weld almost non-stop for a 10 hour shift and have very little if any fatigue at the end of the day. I was skeptical of getting used to the goggle-like configuration of this helmet the first few times I tried it on and had to make several adjustments. Since then, I have learned to like this a lot. The Panoramasxx is the first 'professional' helmet that I own. The auto function works well and I learned that sensitivity needs to be turned way up for light duty TIG or you'll get flashed. Fit and adjustment is good and the secondary adjustment for closer - farther to the inner lens is a bonus. The main helmet body is very light but is fairly rigid and fits well. Auto-darkening lens view quality is good whether welding or in the off state. The outer curved plastic protector is relatively soft and scratches and mars easily. However, I have cleared most blemishes to date with a quick swipe or two across a buffing wheel. ProsGood field of view and clear in all darkness states. Lots of control and adjustment. Auto function works well and is custom turnable for more or less darkening for personal preference. ConsSome may want a little more padding on the nose piece.